Puppies and kittens should be vaccinated at 8, 12, and 16 weeks and annually thereafter. Protects against kennel cough, which is a combination of parainfluenza virus and bordetella bronchiseptica. Recommended if your dog goes to boarding, grooming or dog parks. All dogs in Maricopa County are required to have a rabies vaccine and be licensed with MCACC. 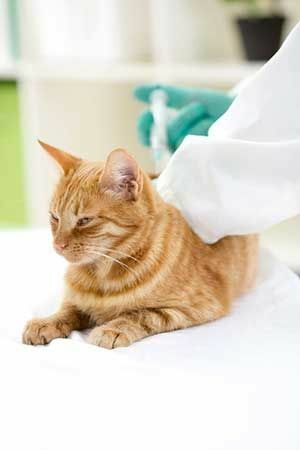 ​The initial rabies vaccine is good for 1 year. The following rabies vaccines are good for 3 years in Arizona. ​Recommended if your cat goes outdoors. This disease is thought to require very close contact to infected cats to be spread, such as milk from mother to kitten or bite wounds. Much more common in city areas, and among un-neutered and stray cats. Multi-cat households also present a higher risk. The symptoms include poor body condition and coat, anorexia, diarrhea and jaundice. The virus attacks the bone marrow which results in leukemia and sometimes lymphoma. Recommended if your cat goes outdoors. Not required for cats in Maricopa County.